Morgan at her pop-up cookie class at Spruce in downtown Bellingham. Photo courtesy: Morgan G. Cookies. Morgan Gaunt, owner of Morgan G. Cookies, can put anything on a cookie. This is not an overstatement. Parrots, bourbon bottles, Union Jacks, sushi, hamburgers, wreaths, succulents and even tiny cookies cooling on a rack on top of an actual cookie are just a few of her artistic creations. Words alone don’t do her cookies justice. They really have to be seen to be believed. On one cookie, she frosted the New York city skyline complete with windows on the skyscrapers, a street with a taxi cab in front, trees and birds flying above. 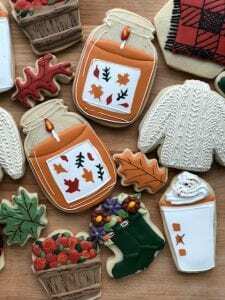 Cozy fall cookies create an ambiance of warmth. Photo courtesy: Morgan G. Cookies. Every cookie set is a different scene all together, each with its own style and color palette. Her artistic range is amazing. One set has portraits of the entire cast of Star Trek: The Next Generation with replicas of the Starship Enterprise. Each little biscuit is created with precise detail, nuanced colors and care. It’s a smooth, edible canvas. Gaunt’s cookies are the epitome of what every cookie wishes it was. Cookie decorating at this level takes articulate care and patience. 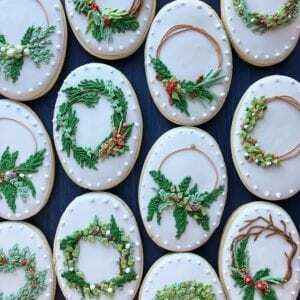 Gaunt can spend up to four hours decorating just one dozen cookies. That’s not including the conceptualizing phase, mixing, chilling, baking “and then you have to make all the icing and coloring and that can take a really long time,” says Gaunt. 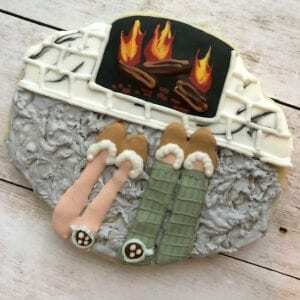 A cozy fireplace cookie creation. Photo courtesy: Morgan G. Cookies. Gaunt is continually challenging herself to find new and unique ideas outside of what would typically be found at an event. 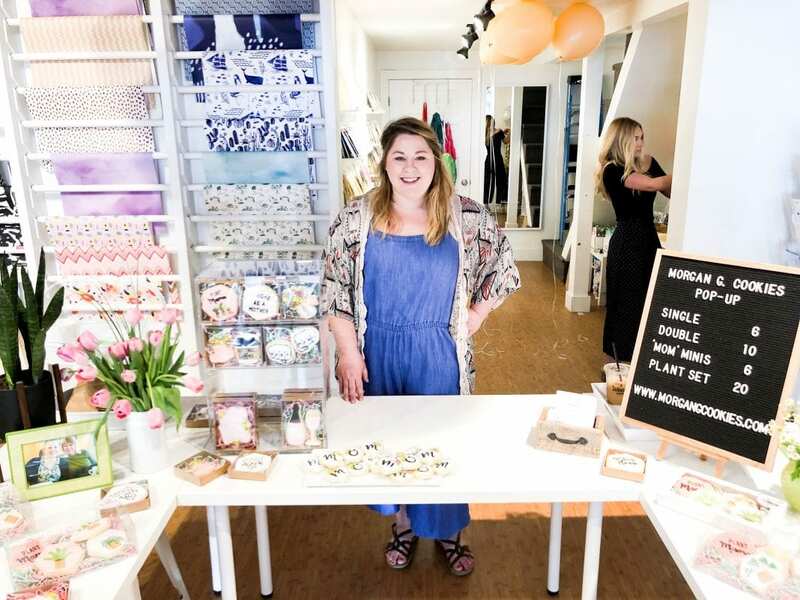 For a baby shower, she might create a soft, hanging mobile or a clothesline hung with colorful baby onesies, with clothes pins holding them up. “I want to continuously push those boundaries,” says Gaunt. “I spend a lot of time doing the prep. I look for fonts, textures, images and illustrations. Sometimes I have people just send me invitations and then I pull inspiration and colors off of the invitation.” Conceptualizing cookie art is her favorite part of the process. Unique and modern cookie wreaths make up a box set from Morgan G. Cookies. Photo courtesy: Morgan G. Cookies. Gaunt began icing cookies only four years ago after buying an online cookie decorating course called Alison’s Cookie Party Online Course. She began creating cookies for friends and family on holidays and birthdays. Soon, the word got out and people started asking her to make cookies for their events. Alison’s Cookie Party class focuses on simple, two-dimensional cookies. Gaunt took that knowledge and morphed it into her own style, creating the one of a kind, 3-D creations that she has become known for. “It took me probably two years before I felt like I could step outside just doing cute royal icing cookies to doing something that was much more my style,” says Gaunt. Eventually, she started a Morgan G. Cookies Instagram account that now has over 6,000 followers. Recognition on Instagram has given her the opportunity to work with some big names in the cookie industry. She’s now shipping cookies all over the country. Morgan Gaunt bakes cookies at home. Photo courtesy: Morgan G. Cookies. Gaunt now teaches her own cookie-making classes. “I get to reach more people and I give people an experience that brings them as much joy as ordering cookies from me,” she says. 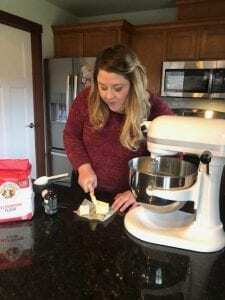 “You can learn how to make your own cookies at home, and I want to give that information away to people so that everyone can have them,” says Gaunt. Her last two classes sold out in a matter of minutes. Gaunt realized that she only has the capacity to make so many cookies in a day, and she finds joy in teaching others the art for themselves. She hopes to eventually have her own studio space to offer classes regularly and would like to travel with her family while hosting classes around the country. To get in touch with Morgan G. Cookies or see more of her work, visit Morgan G. Cookies, Facebook and Instagram. Photo courtesy: Morgan G. Cookies.